Bartell Drugs wants to be the best loved drugstore of the northwest neighbors by providing an exceptional experience that advances their health, happiness and wellbeing. 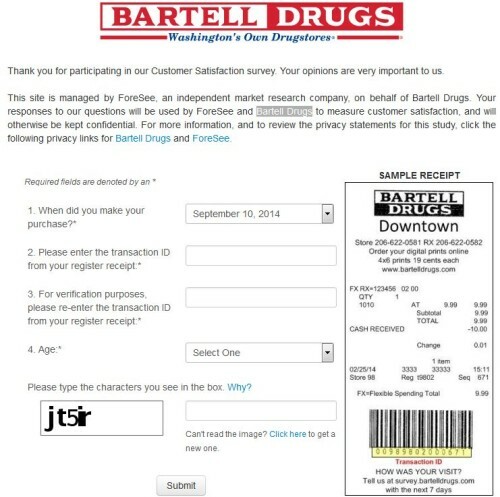 Spare 5 minutes now and be part of the Bartell Drugs’ efforts by completing their customer satisfaction survey. Your responses will help them measure their performance and improve on it. Puget Sound neighborhoods, serving primarily the Seattle/King County area. The company, as it’s claimed, is the oldest family-owned drugstore chain in the nation. Visited the Renton Highlands Bartell Drugs. The cashier Mary is always so friendly and helpful. She is extremely knowledgeable about all the products. I am a Bartell employee at a different Bartell Drugs, and wanted to send a shout out to Mary. I always enjoy coming to this Bartells especially when Mary is working. The customer service is just GREAT at the Admiral Way Bartells !!! I feel so welcome … & I buy so much ! We say it’s the Nordstrom of Drug Stores ! I particularly get the MIST EXCELLENT help from Cindy & Dorothea !!! Congrats on such wonderful employees & store ! I also love your selection of merch ! I find so many things there that I need , all in one stop ! I have been a customer of Bartell’s drug stores for 18 years. I need to get your coupons in the mail, please. My friends do. I do not mean the weekly flyer. In Burien store on December 19th. My cashier was Feldin. She was very helpful in assisting me with some photo prints & a very nice person. Love shopping in your clean, well lite stores with your friendly staff always willing to guide and help you. I specifically went to the Federal Way store today to look at and probably purchase some of the Holidat housewares only to find that the store never received them and will not get them in the future! It does not make me happy chasing “bogus” ads. If you cannot supply all your stores with the items, Do Not put them in your ad. Are we second rate out here in the south end? Sammamish Bartell’s has been our family pharmacy for around 19 years, more or less. We have been taken care of in regular times for prescriptions in a timely manner. Mix ups are always been adressed quickly. More importantly, in times of serious, immediate needs for a prescription refill response has been expedient immediately Whenever possible, which is more often than not. Yesterday, 10/17, I was in dire need of a refill. I called asked how fast can you have my prescription filled. I am not doing well. They Said ten minutes. All the pharmacist are at the ready for All services needed. Well informed, explaining in layman’s terms. Very happy with my visit to Bartell/Kaiser Permanente in Ballard. The NP, Patricia was extremely helpful, knowledgeable and personable. Also gave me some practical nursing advice about eating lunch I while taking an antibiotic. Wonderful! Wonderful collaboration and top notch experience all around. Thanks. Disappointed, bought two boxes of probiotic & vitamin combo pack and got home to notice they expired August of 2017! Seriously? If this is how well they keep track of their stock then shame on them. This is wrong and unacceptable. What about the elderly-special needs clientele who may not have been able to read the expiration date? That’s taking advantage of unsuspecting customers to sell them expired product. I went back to check other boxes in the same area and several other items were also expired. When I pointed it out to the RX counter they were very polite but didn’t seem concerned but assured me that I could still take them! Uhhhh no thanks. I went back to check other boxes in the same area and several other items were also expired. When I pointed it out to the RX counter they didn’t seem overly concerned but assured me that I could still take them! I love your store and pharmacy! Also keep fighting the Seattle employee tax proposal! Totally behind you let us know how to help!!!! The clerks are always there with a friendly greeting and ask if they can help. My go to place for last minute kid birthday parties! You know what, I’m very much inielncd to agree. Your staff at Wallingford Bartell is consistently helpful, friendly and knowledgable. I am an enthusiastic Bartell supporter. Would appreciate if Bartell stocked personal products, such as Free and Clear Shampoo, that are truly preservative and chemically free. The label “natural” does not always assure lack of preservatives. I am one who has heightened sensitivity to preservatives in personal products. Also, please bring back Kiss My Face Olive oil soap. It is perfect for sensitive skin.